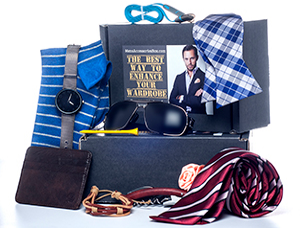 Get a gift of 4-6 awesome accessories tailored to your style. Get cufflinks, ties, tie bars, money clips, sunglasses, lapel pins, socks, phone chargers, and more men's accessories tailored to your personal style. FREE shipping in the United States. $6.99 shipping to the rest of the world. Yours to keep. When you pay for boxes in advance, you save money each month. (We recommend the annual plan, for optimum saving!). Retail value up to $100 per gift box. We ship on the 15th and 30th of every month through USPS. The best deal. Pay in advance & save $48. 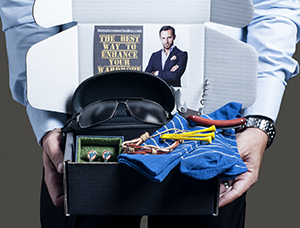 Get every month for one year a delivery of 4-6 accessories tailored to your style. Cufflinks, ties, tie bars, money clips, sunglasses, lapel pins and more men's accessories tailored to your personal style. Comes to just $22 per box.